Saturday, July 5, 2014 • 2:30 p.m.-4 p.m. Tired of clinicians who dance around technical issues when working with singers? We hear you! Laura Brooks Rice will work with a variety of singers and specifically address technical issues. Rice teaches at Westminster Choir College, The Curtis Institute, and is co-director of the CoOPERAtive Program. Mezzo-soprano Laura Brooks Rice has won acclaim on the opera and concert stage for her rich, warm voice, musicality, charm and sensitive acting ability. Since 1985, Rice has been teaching at Westminster Choir College in Princeton, New Jersey where she is Professor of Voice. In addition to teaching private voice, Brooks Rice teaches courses in opera: The Singing Actor: Opera and Opera Auditions: Techniques and Preparation and has also been the coordinator of the opera program. Along with her teaching at Westminster, Rice has a private studio and has been a vocal consultant to the Metropolitan Opera’s Lindemann Program as well as the Domingo-Cafritz Program with the Washington Opera. Her private students are currently singing as regular principal artists at The Metropolitan Opera, Washington Opera, New York City Opera, Sarasota Opera, Opera Theater of St. Louis, Ft. Worth Opera, Dayton Opera, Minnesota Opera, Nashville Opera, Opera Company of Philadelphia, Mobile Opera, Maggio Musicale, Opera Omaha, Portland Opera, Knoxville Opera, San Diego Opera, Lake George Opera, Mozarteum in Salzburg, Opera North, Central City, Atlanta Opera and Aix en Provence. Brooks Rice is on the steering committee for the Singer Training Forum under the auspices of Opera America. 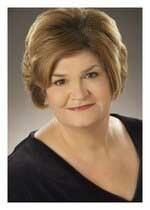 She is member of the board of advisors of Astral Artistic Services as well as the Princeton Festival. She has served as a judge on the panels of the National NATSAA Competition and Astral Artistic Services Annual Auditions. She is the co-director of one of Westminster’s newest programs, the CoOPERAtive Program, a three-week intensive opera-training program. In a diverse repertoire, including Bach’s Christmas Oratorio, Mahler’s Songs of a Wayfarer, Elgar’s Sea Pictures, Brahm’s Alto Rhapsody and Mahler’s Symphony No. 2, Rice has appeared from coast to coast in the United States in concerts and recitals. In recent seasons she has appeared with the Atlanta Symphony Orchestra on several occasions in works including Handel’s Messiah, which she has also performed with numerous other orchestras nationwide. She has performed with the New Jersey Symphony, Bethlehem Bach Festival and Boulder Bach Festival. She made her Mostly Mozart Festival debut singing the role of Apollo in Mozart’s Apollo and Hyacinth, has been heard in Beethoven’s Symphony No. 9 with San Francisco, Atlanta, San Diego and New Jersey Symphonies with conductors, Kurt Masur, Kurt Sanderling, Robert Shaw and Hugh Wolf. In the 1992-93 season Brooks Rice made her debut at the Metropolitan Opera as Wowkle in La Fanciulla del West. Following her debut in 1981 with the San Francisco Opera as Grimgerde in Die Walküre she has appeared with that company in several productions, performing such roles as Dorabella in Cosi fan tutte, Marcellina in Le Nozze di Figaro, Varvara in Katya Kabanova and Suzuki in Madame Butterfly. She has also performed with the Spoleto Festival (Italy) in Honneger’s King David. A participant in the San Francisco Opera’s Merola Program, she sang numerous performances ad an Adler Fellow with the San Francisco Opera Center. Brooks Rice will be teacher in residence at the Santa Fe Opera later this summer.